BRUSSELS — Greece’s prospects for staying in Europe’s currency union darkened on Tuesday after the new Greek finance minister showed up for an emergency meeting in Brussels without a specific new proposal, leaving European finance ministers aghast and unable to judge whether a deal for another bailout package was possible. Greece’s failure to present a detailed plan at a meeting called to review its demands after a referendum on Sunday turned what had been billed as a last-chance opportunity for Greece into yet another display of the substantive and stylistic gulf between the left-wing government of Prime Minister Alexis Tsipras and his country’s big creditors, starting with Germany and other European countries that use the euro. The new finance minister, Euclid Tsakalotos, signaled that Greece would put a plan forward as soon as Tuesday night, and a government official said later that Greece was seeking a short-term infusion of new aid to help it make big debt payments due this month. But the absence any clear and detailed plan from Greece about how it intended to get out of a crisis that has left its banks closed for more than a week and led it to become the first developed nation to default on loans from the International Monetary Fund diminished hopes that a gathering late Tuesday in Brussels of European leaders might end the standoff between Greece and its creditors. Arriving in Brussels for the summit meeting, Chancellor Angela Merkel of Germany said there “there still is not a basis” to even start negotiations on a new funding for Greece from the European Stability Mechanism, a European bailout fund. She warned that no decisions would be taken by leaders despite the rising urgency of Greece’s need for fresh money to stave off a financial meltdown. “I say it is no longer about weeks, but a matter of days,” Ms. Merkel said. Mr. Tsipras, who was also in Brussels for the meeting, grinned at reporters but declined to comment. Still, no one wants to take the blame for a possible sudden, chaotic Greek departure from the eurozone. 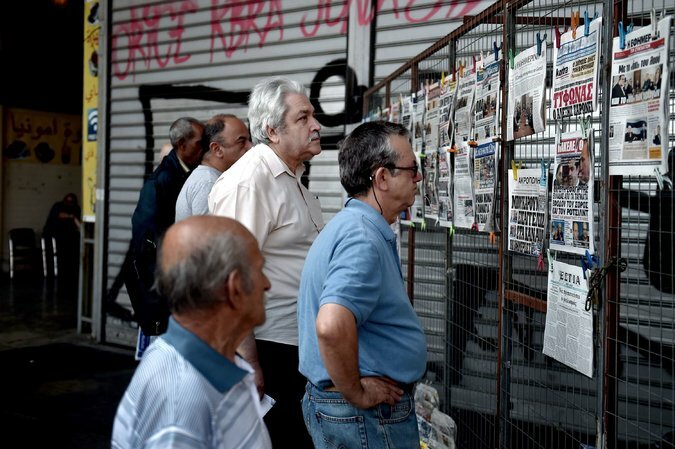 That means that all sides seem ready to keep talking even as the crisis reaches new levels of intensity, and even as Greece hurtles toward a deadline — a payment of 3.5 billion euros, or about $3.8 billion, to the European Central Bank on July 20 — that most analysts think it cannot miss without leaving the eurozone. A senior European official said he expected 19 euro area finance ministers and also national leaders to assemble again on Sunday so long as Greece submitted concrete and viable proposals. The day’s events continued what has become a pattern of crossed wires and mutual incomprehension between Greece and its creditors, frustrating expectations that the dismissal on Monday of Yanis Varoufakis, a combative former professor, as Greek finance minister might drain some of the poison or at least uncertainty from Greece’s tumultuous relations with the rest of Europe. But Mr. Varoufakis’s replacement, Mr. Tsakalotos, surprised his peers by turning up for the emergency meeting with only a vague outline of Greece’s proposal for breaking the long standoff. A person with direct knowledge of the talks, who requested anonymity because of the sensitivity of the closed-door meeting, said that Mr.Tsakalotos had at least struck a far less abrasive tone than his predecessor and seemed open to constructive discussion. Before the meeting, Mr. Dijsselbloem said that finding a way out of an impasse that threatened to send Greece crashing out of the currency union would be “very difficult” and stressed that this depended on Greece presenting solid new proposals quickly to replace ones put forward by creditors last month but rejected by Greek voters in Sunday’s referendum. A Greek government official, speaking in Athens on the condition of anonymity, said the Greek proposals, once they arrived in Brussels, would be a revised version of measures submitted early last week in a letter from Mr. Tsipras to creditors. Those proposals largely matched the ones Mr. Tsipras called on Greek voters to reject. But the official, without elaborating, said the revised offer would reflect the outcome of Sunday’s referendum. The official also said that Mr. Tsipras had spoken by telephone on Tuesday with President Obama and explained Greece’s position. Greece’s departure from the euro would not necessarily destabilize other weaker members of the eurozone or spread havoc in global markets, which have so far reacted relatively calmly to Greece’s troubles. But it would upend one of the European Union’s fundamental principles, a commitment to “ever closer union” in place since 1957, and throw into reverse decades of steady integration. Greece’s delay in outlining what it wants, the latest in a long series of surprise moves by Greek negotiators that have shredded the European Union’s rigid procedures and etiquette, means that Athens lost at least another day in an already tight schedule to try to break months of deadlock and unlock funding so that it can reopen its banks and avoid a potentially calamitous financial collapse. “If there is no progress whatsoever this week, the prospects for Greece staying in the eurozone would become grim,” said Nicolas Véron, a senior fellow at Bruegel, a research organization in Brussels. The continuation of emergency funding for Greek banks by the European Central Bank “is clearly dependent on the likelihood of an agreement between Greece and its creditors,” said Mr. Véron. But if that source of aid is “stopped and no agreement is in sight, it is difficult to imagine a scenario in which Greece stays in the eurozone for long,” he said. But finance ministers were in some cases more accepting, even encouraging, of the idea that Greece should leave. Janis Reirs, finance minister of Latvia, a small Baltic nation that endured its own grinding austerity program and has now returned to economic growth, said he welcomed a possible Greek departure. “If in a system there is an element that doesn’t work, the departure of this element won’t harm the system and in some cases can even be positive,” Mr. Reirs said in response to a question about whether Greece might have to ditch the euro. He voiced bafflement at Greece’s hostility to measures that Latvia and other countries like Spain and Portugal have taken to rescue their own economies. “Latvian people do not understand the Greek people,” he said.